This series of the Rolla Clymer collection includes sent and received correspondence arranged chronologically beginning in 1909. With few exceptions, the correspondence provides a continuous and very complete view of his activities. Much of the earliest correspondence in the Clymer collection pertains to information about the College of Emporia for the period Clymer was a student there. Scattered throughout the remainder of the correspondence is information about Emporia athletics and alumni activities and letters with former classmates. From 1914 to 1918, Clymer was editor and manager of the Olathe, Kansas, Register. In 1918, Rolla Clymer moved his young family to El Dorado, Kansas, where he became editor and manager of the El Dorado Republican. Except for a six month hiatus in 1937 as editor and manager of the Santa Fe New Mexican in Santa Fe, New Mexico, Clymer served the remainder of his professional career in El Dorado. In his later years, Clymer devoted much of his time to efforts to preserve the Kansas Flint Hills region which he dearly loved. In addition to newspaper editorials, he wrote and published numerous widely circulated articles and poems about the Flint Hills. Perhaps his best known tribute was his poem "Majesty of the Hills," which helped earn him the designation as Poet Laureate of the Flint Hills. Rolla Clymer died on June 4, 1977, having been the editor of the El Dorado Times for fifty-nine years. For a complete contents list of the Rolla Clymer collection, see the External Links below. This series of the Rolla Clymer collection includes sent and received correspondence arranged chronologically beginning in 1909. With few exceptions, the correspondence provides a continuous and very complete view of his activities. 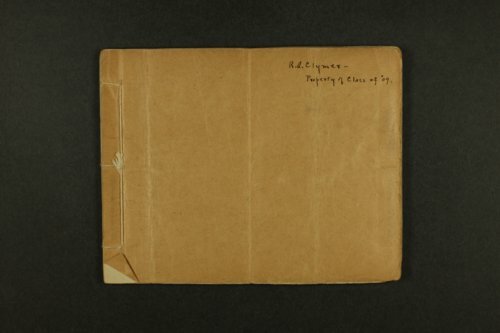 Much of the earliest correspondence in the Clymer collection pertains to information about the College of Emporia for the period Clymer was a student there. Scattered throughout the remainder of the correspondence is information about Emporia athletics and alumni activities and letters with former classmates. From 1914 to 1918, Clymer was editor and manager of the Olathe, Kansas, Register. In 1918, Rolla Clymer moved his young family to El Dorado, Kansas, where he became editor and manager of the El Dorado Republican. Except for a six month hiatus in 1937 as editor and manager of the Santa Fe New Mexican in Santa Fe, New Mexico, Clymer served the remainder of his professional career in El Dorado. In his later years, Clymer devoted much of his time to efforts to preserve the Kansas Flint Hills region which he dearly loved. In addition to newspaper editorials, he wrote and published numerous widely circulated articles and poems about the Flint Hills. Perhaps his best known tribute was his poem "Majesty of the Hills," which helped earn him the designation as Poet Laureate of the Flint Hills. Rolla Clymer died on June 4, 1977, having been the editor of the El Dorado Times for fifty-nine years. For a complete contents list of the Rolla Clymer collection, see the External Links below.